« Net Free Area disallowance motion snubs recreational fishers and environmentalists. 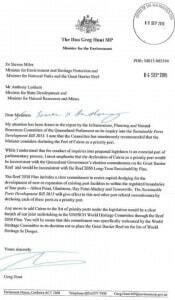 A letter from Federal Environment Minister Hunt to Queensland Ministers Miles and Lynham published on social media confirms the need to pass the Sustainable Ports Development Bill (2015) without amendments that would allow future new dredging in Cairns. “The letter from Minister Hunt reconfirms the need to stick to our promises to UNESCO that recently averted ‘at risk’ listing for the Great Barrier Reef. 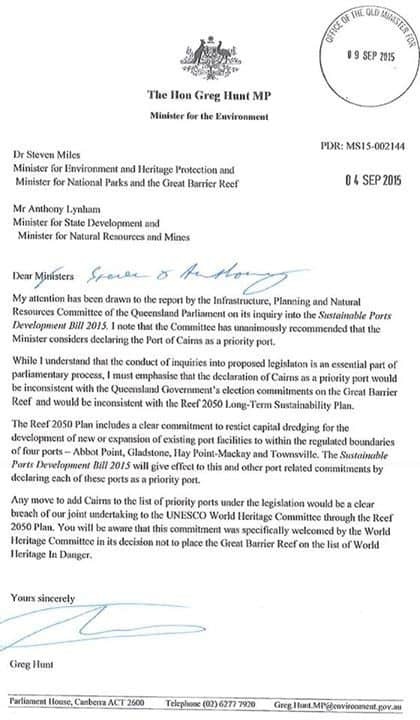 The Ports Bill restricts new dredging to the industrial ports of Abbot Point, Gladstone, Hay point/ Mackay and Townsville, in line with the Reef 2050 Plan and our World Heritage Committee commitments. To derail the Bill with amendments for future new Cairns dredging would put our tourism reputation at risk here in Cairns and could open us up to international criticism that would impact on tourism not just here but across Queensland. We just can’t afford the environmental cost of new dredging and the associated increase in maintenance dredging and offshore dumping.The economic case doesn’t stack up either with a massive cost to the taxpayer projected that would provide little benefit and lots of risk. There are other ways to support our local economy that does not put jobs at risk. The port can and will continue to function and expand without new dredging. Maintenance dredging will continue under the provisions in the Bill. CAFNEC supports maintenance dredging and advocates for improvements in how this is done and not new unnecessary dredging. A well funded local pro-dredging campaign is trying to tell people we need dirty dredging for jobs, but in reality the benefits would go to a select few and the risks would be huge.